It all began with the Battle of London Bridge, or so the story goes. This semi-legendary clash was fought in 1014 between an Anglo-Norwegian army and the Danish fleet of Sweyn Forkbeard, father of King Canute. Norway’s Olaf II sided with the England’s Ethelred the Unready because they were fellow Christians, while the wicked Danes were still inclined to paganism. The reference to Odin suggests that these were still early days for Norwegian chris­tianity and there are doubts about the depth of the Olaf’s faith (and about the ungod­liness of the Danes at that time) but he was never­theless canonised soon after his death in 1030 and later became his country’s patron saint. Admiring Londoners dedicated several churches to him. St Olave Hart Street is sometimes claimed to have been founded in 1056 but there’s no evidence to support the precision of this assertion. It may be roughly right because this was a period when memories of Olaf were at their most favourable – before Norway vainly attempted to invade England in 1066, a matter of days before the Normans succeeded. 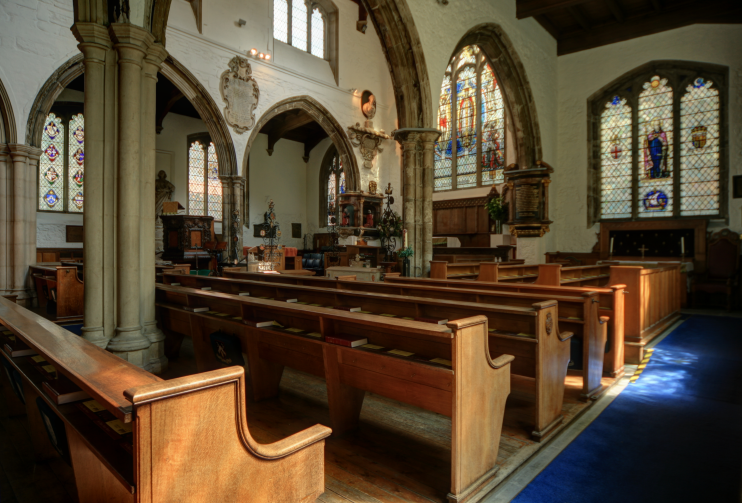 Having almost certainly begun its existence as a wooden structure, St Olave’s was rebuilt in stone in the 13th century and rebuilt again in the 1450s. As with all churches of such vintage, many alter­a­tions and additions were made over the following centuries. 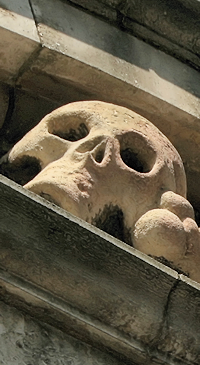 The Great Plague of 1665 is said to have broken out very close to St Olave’s and 300 victims were buried in the churchyard, including the woman who was widely blamed for bringing the disease to the capital. In the parish register, the plague victims’ names are marked with a ‘p’. In 1666 the flames of the Great Fire of London came within about a hundred yards of St Olave’s before the wind changed direction. The church may have been saved by the diligence of its most famous worshipper, Samuel Pepys, who ensured that neigh­bouring wooden struc­tures were pulled down before the fire spread here. Pepys lived in the parish for 14 years and his diary includes many obser­va­tions of goings-on at St Olave’s services. He liked going to church in midwinter, because he was less afraid of walking through the churchyard when snow covered the graves. When Pepys died in retirement at Clapham his body was brought to St Olave’s to be entombed beside his wife Elizabeth. Every year on a date close to the anniversary of his death on 26th May, St Olave’s and the Samuel Pepys Club hold a commem­or­ation service at which a distin­guished speaker gives an address on some aspect of his life. The church was severely damaged by bombing in the Second World War but enough of the fabric survived to permit the building to be superbly restored in the 1950s. King Haakon VII of Norway was guest of honour at the reded­ic­ation ceremony.